It's just us girls at the old farmhouse tonight. Three country girls, one each of the human, feline and canine persuasion. There just happens to be a ruckus of enormous proportions outside. The loudest band of coyotes and dare I say closest to ever approach the farmhouse is visiting tonight. But, honestly, we're doing alright. We're real country girls now. There is something truly eerie about the chattering howls of coyotes... They scare me too. Don't they make the most incredible, mournful, yelping?! Every night at the same time we can here them. Sometimes in the distance; and most often too close for comfort! Just pretend they are rude, obnoxious neighbors! Then put on a happy "Lifetime" chick flick or call the Artist to chat! Ha! Hope you make it through the night :) I am sending good (go away coyotes!!) thoughts your way. All I can say is YIKES! That is a scary sound and I've never even had them very close. Hope you slept well. Coyote is subject of many American Indian stories, songs and ceremonies and if often referred to as the Trickster. Coyotes can adapt to almost any environment, but prefer the prairies and low foothills. They live in undergrounds dens or sometimes caves. Coyote is a survivor. Hunted to near extinction, coyote populations are slowly rebounding in areas where they are least threatened. • Coyotes usually mate for life. This favorable characteristic of Coyote reminds us to be loyal in all our relationships and especially those of a spiritual nature. Roaming from relationship to relationship, without direction or stability should be avoided. • Coyote is a cunning adversary. He sniffs the air and surrounding plants and stones looking for the scent of prey. Once a scent is located he stalks with great stealth and circles the area in which prey is located to understand possible escape routes and determine the best area suitable for an attack to take place. The spirit of coyote shows us ways to fully understand the circumstances surrounding situations in every day life and to develop reasonable plans to achieve our goals. 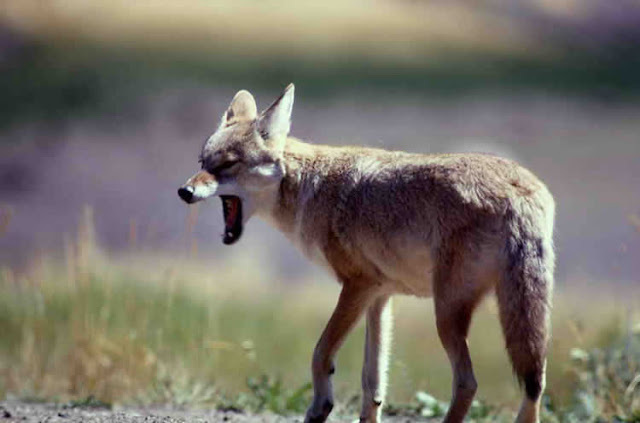 • Coyotes slyly hunt small game and move very slowly into position before pouncing on their prey. Applying this lesson in life, we can learn patience and ways to move forward at the best possible times. • Coyotes are excellent teachers, providers and protectors of their families. They will go to extreme lengths to insure the safety and well-being of their offspring. Visions and dreams in which coyote spirit makes itself known may bear a message of duty and responsibility to ones family, community or employment. • Coyotes work well with its brothers and sisters to develop a strong community. Like the coyote we can work with others to get what we want in life. Followers of coyote medicine put other peoples needs before their own. • Coyote is always on the look out for traps set by both humans and other animals. They move cautiously through their environment ready in a flash to move out of dangers way. Thank the coyote spirit for showing you ways to avoid life's pitfalls. Andrea - have you ever read Barbara Kingsolver's book Prodigal Summer? She talks about coyotes thruout the book, their hunting habits, family dynamics, etc - very interesting and informative, and the book is fiction, but is a wonderful story about small town/farming life with 3 women as the main characters, all at different ages, 1 in her late 20's, 1 in her 40's, and one in her 60's or 70's. It's my favorite book of all time. And my brother has put it on CD for me, so I can listen to it as much as I want. Hope you and the girls slept well. Take care, from KY. Doesn't that just freak you out when it happens!! We hear them in the woods but every so often it seems like they are right underneath my bedroom window. Oh how I want to take a picture of them. Oh how I hate the sound of coyotes at night! They are so eerie and scary sounding to me. Wow, brave girls!! We do not hear them very often but when we do I freak! I'm proud of you! Can't say we have heard any coyotes lately but..... Last fall I spent a night alone cause CH was out of town. I never realized how lonely the country could be. I found myself on our porch sleeping on the glider loveseat with a small co2 pistol under me. I was more afraid of man rather than beast. Never used it and it wouldn't have hurt a flea and I couldn't have hit the broad side of the barn but it made me feel better :) Man I was glad when CH got home. Hoping you real country girls are doing a-ok! Coyotes are in your stalker's and my neck of the woods too, Andrea. Last summer a couple of young coyotes were running down the road when I was out with my son who was getting some driving practice. The husband of a friend recently witnessed a couple of coyotes taking down a deer in the conservation area ... just down the road from your stalker. Just a couple of weeks ago a very large one ran in front of me (I was in my car thankfully). Neighbours who have also seen this large one think it is a wolf, but I was talking with one of my cousins who is an avid outdoors man and he said there are no timber or brush wolves in our area. He said it was more than likely a coy dog which are larger than coyotes.